Saga Books of Calgary, AB has just released a sixth book by Canadian author, Martha Jette - a book destined to keep you on the edge of your seat. 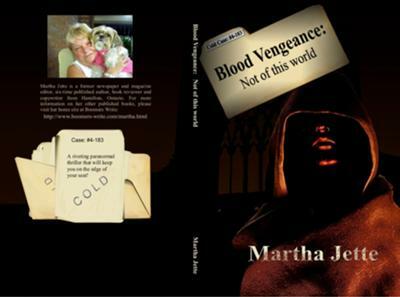 “After much work and many revisions, I’m thrilled to say that Blood Vengeance: (Cold Case #4-183) Not of this World is now available to the public,” said Ms. Jette from her Hamilton, Ontario home. For more information, please visit: http://BloodVengeance.yolasite.com. The book can be ordered now through http://www.sagabooks.net. Join in and write your own page! It's easy to do. How? Simply click here to return to Publishing News.